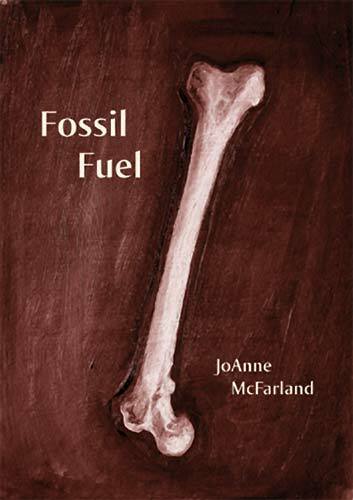 The stark monochrome image of a single bone, an inverted femur, appears on the cover of Ms. McFarland's latest collection of poems, Fossil Fuel. Anatomists tell us (but the author does not) that the femur is the body's most variable in size; in fact, more than shinbones and spine (normally always in the same proportion to the rest of the frame), the length of this bone is what actually determines a person's stature. The stature of a people or peoples, their relative worth, worth of the things they make, and what they leave behind, is assessed from many angles in Fossil Fuel. Disarticulated skeletons and archeological artifacts, unearthed and reconstructed, are imparted meaning by bringing past to present, and thus redeemed. In that evaluation the author also includes herself. The architecture of her book, meticulously crafted, is built from two conceits. The first is inspired by a quotation from Rumi, which prefaces it: "if there is hunger / if there is famine / show me your harvest / show me your resource." The second centers on the story of Irene Mound, a Native American burial site near Savannah, Georgia, and the forty-five African American women hired by the WPA in 1937 to dig up its secrets. From there the radius of its themes widens into a mythic hero's journey from darkness to light, underworld and return, as in the legend of Persephone, harbinger of the seasons and harvest, making a circuit from earth to sky and back—for as it says in the book's opening poem, "Burial Grounds", "earth is the only anchor". The grayed words are the "fossil fuels" that bring to light what history has kept buried yet knows lies beneath the surface. Faint, as though these words cannot be spoken out loud but only whispered. Or are they gray because aged and fading? Or transforming from solidity to light, not decaying but etherealizing and transcending? The speaker of the poem dreams she can see through her arm, and is no longer a woman, nor even human, but lives only for light. In "Solar Eclipse", as in several other poems, layers of meaning and the interplay between them—altered/alternative, hidden/uncovered, concrete/abstract—are again conveyed visually (perhaps not surprisingly, since Ms. McFarland is also a visual artist), by contrasting black- and gray-tones in the typography itself. Here, in a personalized re-telling of the Persephone myth, the poem's second voice, un-eclipsed, becomes (despite being grayed), ironically, the more 'substantial.' "Talk about the light" becomes "luminous girl", and "an afterthought" becomes an "afterglow"; or, substantiality reversed, recedes into shadow again, where "loving the light" (in black type) becomes "losing the world" (in gray). In other poems, such as "Seeker," two alternating voices weave together dual realities, seeking wholeness, even as they remain separate. At the site of the Irene Mound dig hummingbirds flit from flower to flower harvesting nectar as an African-American WPA worker exhumes the bones of a young Native American boy, both birds and woman gathering, but oblivious of one another. Then in one deft simile coming at the end of the poem the two "breachable" worlds are linked, becoming one by trading places: the evanescence of the hummingbird's life likened to a digger's sieve, the ancient remains of the boy's body to that of a once-humming hive. Ideas of sieve-like permeability, of how real and imagined worlds, worlds constructed and de-constructed, then reconstructed again, gently seep or deeply penetrate into the texts of nearly all the poems, but especially where the author employs two voices. She explores the myriad possibilities of the two-voiced technique with great inventiveness, sometimes interlocking one poem with another, as though in dialog; or, within the same poem, looping voices back on themselves to uncover what lies more deeply within a phrase by reiterating it, or to represent an alternative (dialogic) meaning by slightly altering its echo. Interspersed between the poems of Fossil Fuel's second part, "Harvest", snippets of text presumably taken from the diary entries or interviews of one of the WPA women, becomes in itself a sort of meta-poem, adding yet another layer to the concept of two-voiced poetry. Ultimately, the dialog implied by two voices becomes a way of speaking to and of the self, digging ever deeper into one's personal archeology to exhume buried and fragmented desires, to re-examine them and transmute them into the light of holism. In Fossil Fuel the process follows the idea of Rumi to "show me your harvest / show me your resource". The book's first part, "Resources", meditates upon the essential materials, the elemental building blocks from which art or artifacts are created, and then in its second part, "Harvest", examines what may be reaped from them. "Burial Grounds," a sectional poem whose sequence of constructive and destructive power circularly moves from stone to ash to glass, finally yields, in the next poem, to "Fire," a personal lyric inspired by the glassblowers of 13th century Venice displaced to the island of Murano because of fear of fire hazard to the wooden city. "For years I stole closer and closer to the shore," the speaker of the poem says, "stepping over broken bottles from stone, to stone, to stone." In "Plutonium", which ends the first half of the collection, the circularity of this process is reinforced by the poet's plea, "Whosoever comes after / please begin at the end / Don't bear this cloud / Amen". Her flesh resembles powder instead of skin. before nightfall, no one speaks of shadows, or loss. The ancient mound where the dedicated women of the WPA excavated, often in harsh weather and under trying working conditions, the remains of a vanished race of Native Americans unknown to them but intuitively sensed as kin, in the 1400s became the site of a church and school founded by Portuguese missionaries, who named it Irene, meaning peace. And so, too, these poems instill in the reader a feeling of profound calm and peace that, having shared in the poet's journey, can only come after having dug so deeply, of having descended into one's own private underworld to confront one's shadow-self, then risen back into the light with what has been learned. Brant Lyon is a poet and composer of music who often conflates both, as in his peripatetic/sporadic 'jazzoetry' reading series, Hydrogen Jukebox in NYC, and in his newly released poemusic CD, Beauty Keeps Laying Its Sharp Knife Against Me (Logochrysalis 2008). Other recent publications include his chapbook, Your Infidel Eyes (Poets Wear Prada 2006), now in its second printing; and poems and photographs anthologized in A Cautionary Tale: Peer into the Lives of Seven New York Poets (Uphook 2008).